For the past couple of months, I have been a part of a First Place Bible study. If you aren’t familiar with First Place, each 12-week session combines Bible study, scripture memory, accountability, and healthy living (eating/exercise). It’s a great program that I highly recommend for anyone who wants to lead a healthier lifestyle. Reflecting on what I have learned this session, I keep coming back to the idea of “portion control.” So much of learning to eat better (at least in our culture) is connected with portion control – we know that we should eat more fruits, vegetables, and whole grains, but we can’t seem to get our minds around the idea that we should not super-size everything. We want a better monetary value, but the price is often poorer health. Unfortunately, it’s not just our fast food meals we want to super-size. We want larger houses, better connections, newer cars, bigger careers. We want life to be Burger King – “your way, right away.” We want what we want right now, and we want a lot of it. But God did not create us to live super-sized lives. In fact, after a particularly busy season of ministry, Jesus said to His disciples, “‘Come away by yourselves to a desolate place and rest for a while.’ For many were coming and going, and they had no leisure even to eat” (Mark 6:31). Jesus knew that His disciples needed to set boundaries – or portion control, if you will – in their work and ministry. The work they were doing was good. They were helping people and spreading the Good News. And yet, too much was still too much. I need those same boundaries in my own life. Lots of good opportunities present themselves every day, but wisdom comes in knowing when to say yes, when to say no, and when to say maybe next time. When to turn off the screens. When to take a day off. When to ask for help from friends. What about you? 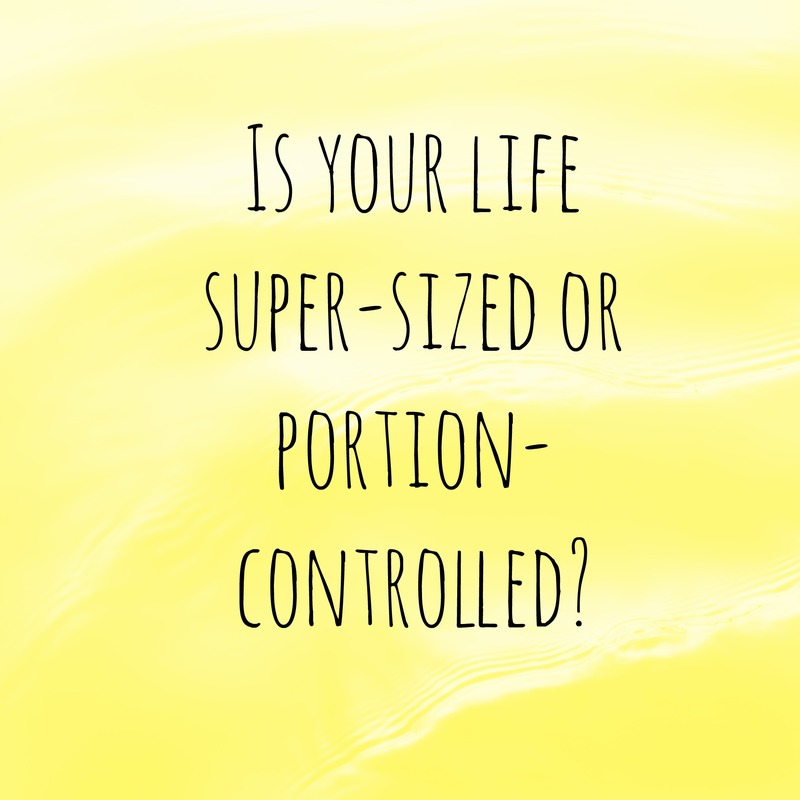 Are there areas in your life where you need some portion control? What is consuming you in an unhealthy way? Seek God’s guidance and make plans to cut back (or cut out) in those places. We’re halfway through the program! Yippee!! As of week five, our group has lost at total of 144 pounds. Way to go, y’all! We have now had a few people drop out. We have some people who haven’t been to class in a couple of weeks. If any of you are reading this, we miss you! Yes, First Place is not easy. But, yes, the results are worth the effort. Today, my battle is with exercise. I simply don’t want to. I have a busy day ahead, and I don’t want to take even 20 minutes away from other things that are demanding my attention. But when I get up from writing this entry, I’m going to make myself do it. As someone said on Sunday at Yellow Creek, we must lead our hearts, not follow our emotions. Even when we don’t FEEL like doing the right thing, we can CHOOSE to do the right thing. So, here I go … choosing to exercise! We have collectively lost a total of 130 pounds over the first month! That’s about the size of an adult woman – a whole person! I can already see a visible difference in a few folks. I know that it comes easier to some than it does others, but if any of y’all are reading this … hang in there! We’re almost to the halfway point! As we were discussing this verse, I was consumed with the thought that our ideas of prosperity, hope, and our future are not necessarily the same as God’s plans for our lives. Specifically, the story of missionary and martyr Jim Elliot came to mind, and I realized that God’s promises in Jeremiah applied to his life just as much as they apply to mine. Yet, God allowed this young man – one who had given up every earthly thing in order to tell others about the Savior – to die a violent and tragic death at the hands of those to whom he had been sent. How is that prosperity? How is that hope? How is that the promise of a future? Jim Elliot died at the age of 28 years old. Had he lived, who knows what he might have accomplished. Some would call his death a waste. Yet, because of his death, hundreds have surrendered to God’s call to missions – many to Ecuador where Jim served and was killed. Because of his death, Jim’s wife and Nate Saint’s sister (Nate Saint was also martyred at the same event) were able to walk into the same Waodani village and demonstrate forgiveness and love to the men who killed their friends and family, sharing the forgiveness and mercy of the Savior. One of the men who had a part in the murders is now actively sharing his faith with others around the world. Prosperity, hope, and a future were found in an eternal reward for Jim Elliot. How does this apply to us? We may never leave the country to share the gospel, and God may not require our lives from us in this way. Yet, he may not choose to bless us with material rewards. Our prosperity, our hope, and our future are in the hands of God. He will bless us as he sees fit – and it will be more than enough. Monday night heralded our successful completion of week one of First Place. We all did the oh-so-scary weigh-in, and … drum roll please … the group had lost a total of 69 pounds! Yippee for us! I don’t know about everyone else, but I am a little tired of spinach salads and V8 Fusion, mostly because those are my favorite (okay, only) vegetables. Some of the newness and excitement is wearing off, and the water is starting to taste like, well, water. This morning, I walked with my friend K. She is SEVERAL inches taller than I am, with MUCH LONGER LEGS. AND YES, I AM SHOUTING BECAUSE SHE TOTALLY WORE ME OUT. K. is also a physical therapist and very kindly suggested that I might like to take a couple of ibuprofen when I got home because she thought I might be a little sore. I think that we are all going to make it to the end. The newbies looked a little less stressed out at the end of class. So, how about everyone else? How are you doing this week? Monday was the day. The day we began First Place at Yellow Creek Baptist Church. We had 30 or so people attend the first session. Most of the class has done this before. I felt a little sorry for the new folks – they left looking a little shell-shocked. Hopefully they will all stick with the program. It gets easier after the first week or so, and you learn how to tally your food exchanges. Today, as the “newness” has worn off, I have been thinking about the issue of self-discipline, and why we so often struggle in this area. I think our Burger King (Have It Your Way) culture has something to do with it. I also think that our sinful, fallen natures lead us to want what we want, when we want it. No one participating in First Place is going to be deprived of anything they need to live a full life. We may struggle to find the time and motivation for daily exercise, or we may think that the last eight ounces of water for the day will send us floating downstream, or we may really, really want cheese fries … or is that just me? Intellectually, we know that the results after 12 weeks will be for our best … better health, a slimmer waist line, a sense of accomplishment at having reached the goal. Now is when we must exercise our faith and our trust that God has our best – not just our good, but our BEST – in mind as we discipline ourselves to resist temptation and to make wise choices. Temptation to gratify ourselves exists in so many areas – the way we use our time, the entertainment we choose, and how we choose to care for our bodies. We find self-discipline by maintaining our time in the Word and in prayer.